We stumbled upon this glorious blog post from Mother Hermit about the lovely Wigwam® site, Springhill Wigwams, based on the beautiful east coast of Northumberland. 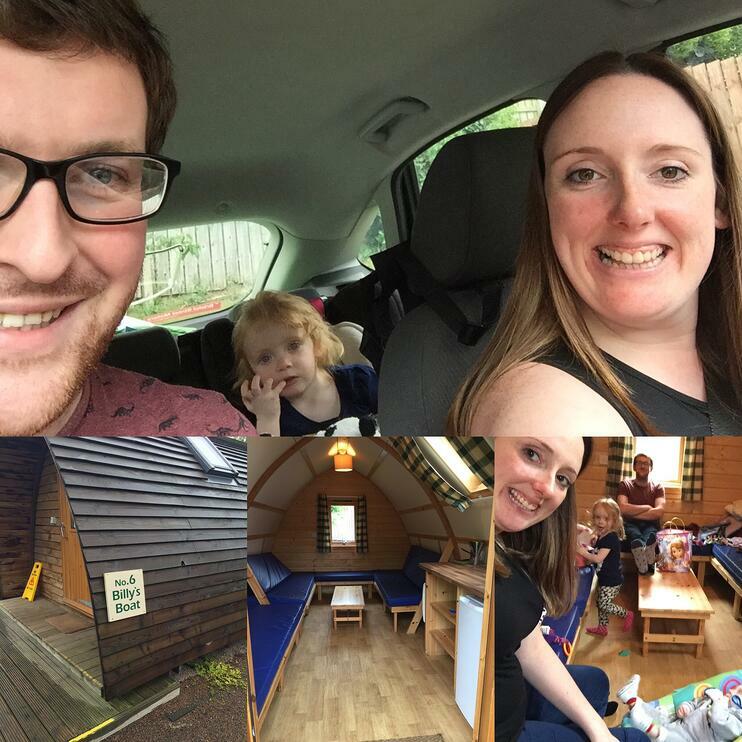 Read about how one young family enjoyed a quick getaway in the Wigwams. Camping. I absolutely love camping. I remember in Summertime when I was little my Dad used to help me and my little sister put a two-man tent up in the back garden and we would spend the whole day in it. We would cosy up with our duvet, playing all sorts of games for hours and even eat all of our meals inside the tent. When we were a bit older, on summer nights we would sleep in it in the back garden too but my parents never actually took us anywhere to camp properly- I think it was my Mam’s worst nightmare holiday! 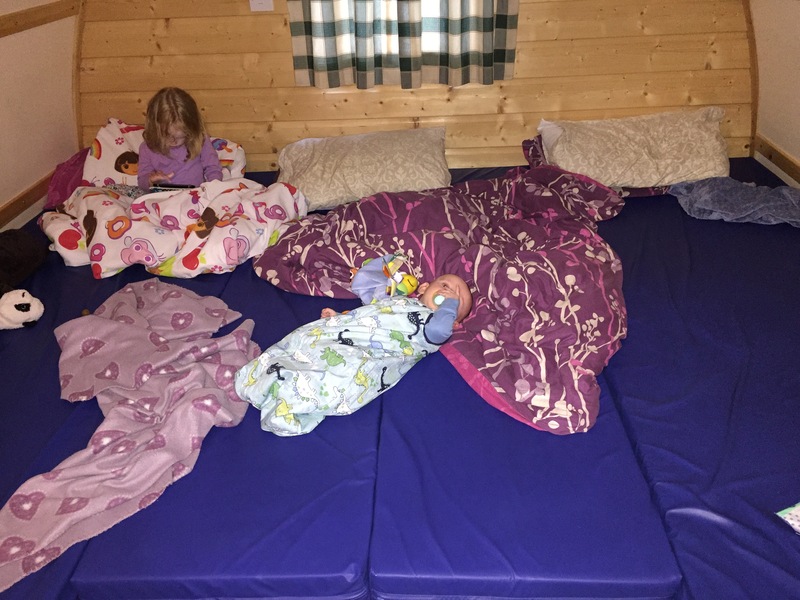 Recently I’ve seen a lot of blog posts about ‘camping with young children’ and have been tempted by the idea of taking our two. Whilst doing a bit of camping research online though I came across ‘Glamping’ and noticed a lot of Wigwams as an alternative to a tent. So I decided to see if I could find one not too far from home for us to try for a night as a kind of ‘trial run’ to see how the kids liked it. This is when I came across Springhill Farm Wigwams, a caravan, camping and wigwam site on a working farm in Seahouses, Northumberland. 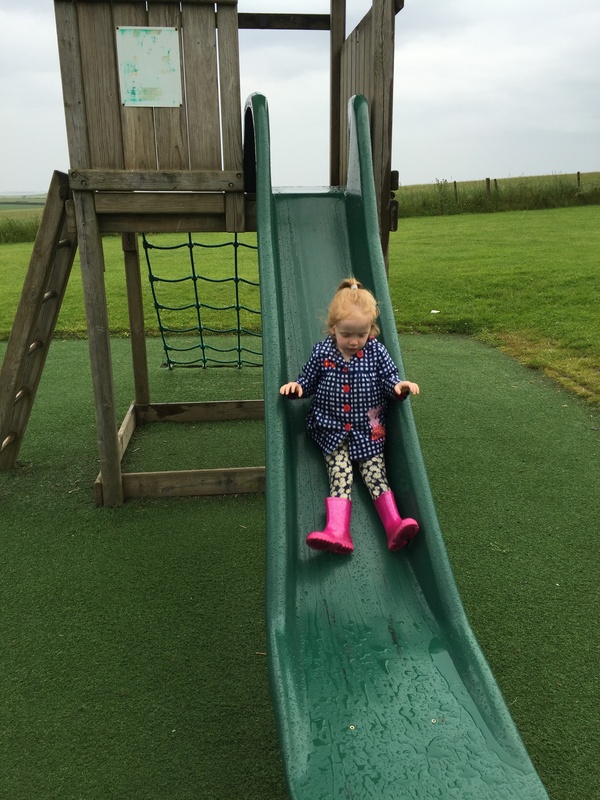 Once Little V had finished nursery on Monday we packed up the car and headed up to Springhill Farm, an hours drive from where we live. We’d already received an email which confirmed that there would be a sign in the reception window to tell us which Wigwam we would be staying in and that the key would be in the door of the accommodation for us to just let ourselves in anytime after 2pm. Sure enough our name was shown, matched up with number 6, and the key was in the door. Unfortunately as soon as we got there the heavens opened so we quickly unpacked the car and made ourselves comfortable inside the Wigwam. After spending some time settling in we decided to head out for a little walk around the site. We’d promised Violet we’d find the park. It wasn’t hard to find and her face totally lit up when she had seen it but obviously it was soaked. That didn’t put her off though, she climbed straight up to the top of the slide and had a quiet moment of contemplation- ‘do I go down and get a wet bum or go back down the ladder? !’ Hmmm… decisions of a two year old! obviously she flew down it and started screaming in panic that she had a wet bum so we headed straight back to the wigwam to get dry. As we were only staying for the one night we hadn’t bothered to pack anything for our evening meal so we could eat out but with the weather being miserable all we wanted was to share a takeaway, so we headed into Seahouses to pick up a pizza and chips- and it was delicious! On site there is a communal kitchen for the use of wigwam occupants only so we decided to eat our dinner in there. What a fantastic area it is too! With ovens, kettles, fridge freezer, all the pots, pans, crockery you could need, condiments, plenty of tables, highchairs and even a television on the wall, we were sorted. There’s also a BBQ area outside in between the Wigwams which you can hire, it’s all undercover and looks really pretty when it’s dark as it’s covered in lights. If we’d have stayed another night we definitely would have booked in to use it for dinner. We didn’t get to use the fire pit which was outside of the wigwam as the rain was getting heavier and heavier and clearly wasn’t going to stop so I crafted some marshmallow sandwiches in chocolate biscuits for Violet. It was so easy to make the bed up and again we were so surprised at how big it was, no chance of being squashed at all! With the kids tucked in, a few cans of cider were shared between me & G and by about 11pm we were so tired we crawled into bed. What an amazing sleep we had too. All the fresh air of being in the countryside and the comfiness of the bed meant we all woke up early totally refreshed and the kids were both in a good mood- tells you how well they slept! We had to check out of the Wigwam by 10am so we jumped up, headed to the bathrooms for a wash and then packed up the car to go strawberry picking! So our stay in a Wigwam with the kids was an absolute success- apart from the bad weather obviously but no camping trip is complete without rain! We can’t wait to go back and hopefully have some nice weather so we can explore a bit more and I think we’ll stay for 2 or 3 nights next time now that we know the kids were okay. Being away from technology was amazing too, it’s nice to have a break every now and again (Wifi is available on site at an extra charge if you really need it). Although I’m glad we took Violet’s tablet and charger because of the rain we needed something to entertain her and she’s not quite at the card playing or board games age yet. 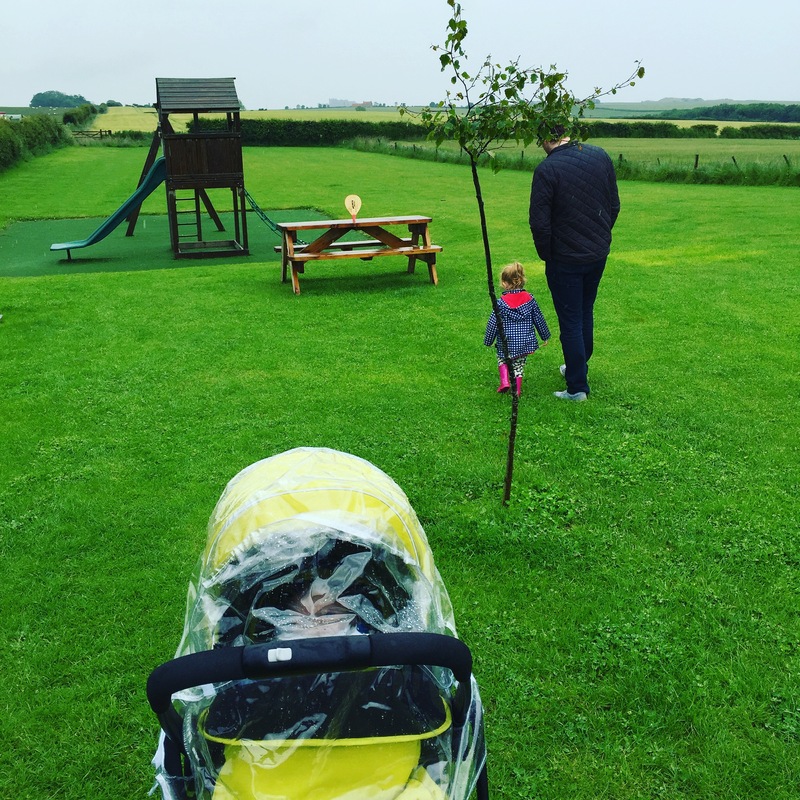 If you’re like me and you’ve been contemplating the ‘camping with kids’ holiday, I totally recommend you try a Wigwam and if you’re visiting the North East I totally recommend you book up at Springhill Farm- although it’s fully booked through the school holidays and I’m constantly checking the website for cancellations ha!